The subscription contains free access to the web edition of all volumes since 2003 . In addition subscribers can use the app 'Quintessence Journals' for free. Clinicians, general practitioners, teachers, researchers, and public health administrators will find this journal an indispensable source of essential, timely information about scientific progress in the fields of oral health and the prevention of caries, periodontal diseases, oral mucosal diseases, and dental trauma. 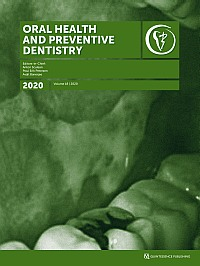 Central topics, including oral hygiene, oral epidemiology, oral health promotion, and public health issues, are covered in peer-reviewed articles such as clinical and basic science research reports; reviews; invited focus articles, commentaries, and guest editorials; and symposium, workshop, and conference proceedings. Editorial: Fake medical news - how can we fight it? Purpose: To compare the therapeutic effects of the resin infiltration technique, self-assembling peptide (P11-4), and fluoride varnish application on white spot lesions (WSLs) on buccal surfaces based on LF pen measurements and LAA-ICDAS scores. Materials and Methods: The lesions of 113 patients from a total of 319 patients with at least four visible WSL on buccal surfaces were assessed by LAA-ICDAS and laser fluoresence (LF pen). To be included in the study, participants were required to have at least 4 buccal WLSs, each in different quadrants, with an LF pen score ≥ 8. Twenty-one patients were included in the study based on the laser fluoresence values. The lesions were randomly assigned into 4 groups (n = 21): IG (Icon), CRG (Curodont Repair), DG (Duraphat), and CG (control) groups. The treatment protocols were applied, but the control group received no treatment except regular brushing. Lesions were scored by LAA-ICDAS after 3 and 6 months and LF pen after 1 week, 3 and 6 months. Results: There was a statistically significant decrease in LF pen measurements of the control and the intervention groups after 6 months when compared to baseline. The greatest lesion regression was observed with IG (-23.25 ± 18.21), which differed statistically significantly from CRG (-8.15 ± 13.89), DG (-10.1 ± 10.31) and CG (-4.15 ± 9.72), followed by DG which differed statistically significantly from CG. Statistically significant differences were observed in the activity status of the lesions between baseline and 6 months, except for the control group. Conclusion: In this study, the lesion regression rates shown by mean LF pen values in all groups after six months encourages the management of non-cavitated smooth surface caries lesions with non-operative treatment approaches. Regular brushing and professional tooth cleaning seem to be effective for the management of WSLs on buccal surfaces, and resin infiltration or fluoride varnish might enhance the improvement of these lesions in moderate- to high-caries-risk individuals. Purpose: To compare the efficacy of a 2.5% w/w smaller particle-size (ca 4 µm) calcium sodium phosphosilicate (CSPS) dentifrice (test) to an occluding dentifrice (8% w/w arginine) (comparator) and a negative control dentifrice in an 8-week, randomised, controlled, parallel-group, stratified (maximum baseline Schiff sensitivity score) study in adults with dentin hypersensitivity. Materials and Methods: The sensitivity of two selected teeth was assessed at baseline and after 1, 2, 4 and 8 weeks in response to evaporative (air) (Schiff sensitivity score and visual analogue scale [VAS]) and tactile (tactile threshold) stimuli. Results: Of 151 randomised subjects, 147 completed the study. Statistically significant changes from baseline were reported for test and comparator dentifrices at all weeks on all measures (p < 0.05) with no statistically significant differences between them. The negative control dentifrice group was statistically significantly different from baseline in all measures by week 8 (p < 0.05). Test and comparator dentifrices demonstrated statistically significantly greater improvements in Schiff sensitivity from week 2 compared to the negative control (p < 0.05). There was a statistically significant difference in favour only of the comparator dentifrice over the negative control at week 8 when examining tactile threshold (p = 0.0435) and at week 4 with VAS (p = 0.0425), with no other between-group differences. The dentifrices were generally well tolerated. Conclusion: No statistically significant differences were found between a small particle size 2.5% w/w CSPS dentifrice and an 8% w/w arginine dentifrice in terms of a dentine hypersensitivity decrease. Purpose: To assess the quality of toothbrushing of children with intellectual disability (ID). Materials and Methods: One hundred thirty-six children, 68 with ID (SG = study group) and 68 non-ID (CG = control group), were paired. Their caregivers completed a questionnaire about socioeconomic and demographic characteristics and another about oral hygiene habits. The toothbrushing technique and position adopted were documented and the duration of the procedure was measured. A modification of the Simplified Oral Hygiene Index (SM-OHI) was used to classify the quality of brushing as: adequate, when all the teeth had SM-OHI 0 or 1; or inadequate, when at least one tooth had SM-OHI 2 or 3. The Kolmogorov-Smirnov test was used to assess the normality of data distribution for age, duration of brushing and SM-OHI. Fisher's exact test and the chi-squared test were applied to assess the association between ID and oral hygiene habits or characteristics of toothbrushing. To compare the duration of brushing groups, the Mann-Whitney test was applied. Student's t-test for independent samples was applied to compare mean MS-OHI. Results: Mothers were the main persons performing children's toothbrushing in SG. They reported a higher daily brushing frequency, longer toothbrushing duration of children in the SG, SG children had lower SM-OHI scores and were thus rated as having adequate toothbrushing, in contrast to the CG (p < 0.001, p < 0.001; p = 0.012; p < 0.001; p < 0.001, respectively). Conclusion: Toothbrushing provided by caregivers for ID children was more effective than toothbrushing carried out by non-ID children of the same age and gender. Purpose: The objective of this study was to investigate the relationships between oral health behaviour and personality profiles among dental students. Materials and Methods: One hundred six consecutive (pre-)clinical dental students (58 females and 48 males) were recruited for this observational study. Participants' oral health behaviour was evaluated using the Hiroshima University-Dental Behavioral Inventory (HU-DBI). The NEO Five Factor Inventory (NEO-FFI) was used to assess the participants' personality profiles. Main outcome measures were personality dimensions measured by NEO-FFI (neuroticism, extraversion, openness, agreeableness, and conscientiousness) and oral health behaviours measured by HU-DBI (dental visits, toothbrushing, oral health awareness, and oral hygiene practices). Statistical significance was set at p < 0.05. Results: All participants were completely analysed. The students' level of education and age had no relationship to the HU-DBI and NEO-FFI scores (p > 0.05). The conscientiousness personality scores were associated with better oral health attitude and behaviour (p = 0.018). Conclusions: Higher scores of the conscientiousness personality dimension were associated with better oral health attitudes and behaviour. Therefore, it is recommended to consider assessment of personality dimensions when oral health attitudes and behaviours are evaluated. Personality profiles might affect oral health behaviour and attitudes of dental care providers. This interaction should be considered as it might potentially impact professionals' capacities to offer oral health care, and this would influence patients' oral health. Purpose: New methods of public education in oral care must be developed, because the public understanding of the importance of oral care is insufficient. This questionnaire study examined the parameters 'awareness and attitude relevant to teeth and mouth' and 'consciousness and attitude of daily life' in order to clarify what kind of information is needed for public education in oral care. Materials and Methods: Data gathered in a survey of oral care behaviours and lifestyle among the elderly were analysed for oral care awareness and health of the teeth using the factor analysis method. The respondents were divided into four groups according to two factors relating to oral health condition and oral care awareness. Results: The high oral-care-consciousness group had a greater awareness of general health and sociability as well as life satisfaction than did the low oral-care-consciousness group. However, the respondents' economic situation had a larger effect on life satisfaction. The respondents were then divided into higher, middle, and lower economic status groups, and the relation between oral care awareness and life satisfaction was analysed for each group. As a result, the correlation between life satisfaction and oral care consciousness was observed by excluding the economic factors. Conclusion: The present data suggest that oral care awareness may contribute to improvement of lifestyle and life satisfaction. Materials and Methods: A national survey was carried out among 615 15-year-olds of both sexes living in urban and rural areas. Subjects were selected via cluster sampling. The mean DMFT and its components, the tooth distribution pattern of caries and percentage of subjects with gingival bleeding and gingival pockets were analysed. The information regarding sociodemographic, oral hygiene and nutritional variables was collected via questionnaire to evaluate their relationships with caries and periodontal parameters. The t-test, bivariate and multivariate logistic analyses were conducted to evaluate the differences and dependent variables of caries prevalence and gingivitis. Results: Caries prevalence was 94.0%, and DMFT was 5.75 ± 3.74. Higher DMFT, DT and MT values were found in rural areas. 50% of the subjects carried about 75% of the total caries burden. Severe caries (DMFT ≥7) was associated with toothbrushing less than twice a day, not using a fluoridated dentifrice, frequent consumption of snacks and absence of pit-and-fissure sealants. The prevalence of gingival bleeding was 37.4% and shallow pockets 2.8%, which were higher in males and rural areas. Gingival bleeding was associated with toothbrushing less than a twice a day, not using dental floss and consumption of fresh fruits and vegetables less than once a week. Conclusion: The prevalence of oral diseases in Poland is very high. Additional strategies must be implemented to promote oral health early on to improve oral hygiene practices and nutritional habits. Purpose: This dental practice-based pilot study aimed to investigate the efficacy of diabetes mellitus (DM) screening based on questionnaire replies. Materials and Methods: 116 patients were screened in a private dental practice when visiting the dentist for a regular check-up. The Find-Risk (FR) questionnaire was used for diabetes screening. FR-positive (FR+) patients were referred to a diabetologist for further diagnostics (blood glucose, HbA1c); FR-negative patients (FR-) did not receive a diabetological examination. Furthermore, dental findings (DMFT) were obtained and periodontal condition was classified into no, mild, moderate or severe periodontitis, based upon periodontal pocket depth and clinical attachment loss. Sensitivity and specificity of the FR questionnaire and a modified FR questionnaire (additional inquiry if severe periodontitis had been ever diagnosed) were determined in a statistical model. Results: 102 patients with a mean age of 56.31 years were included. Seven patients had known DM. A total of 36 patients were FR+, including the seven patients with known DM. Only 16 of the 29 participants (55%) followed the recommendation to see the diabetologist. Nine of these 16 patients showed conspicuous blood glucose findings. Both with and without modification of the FR questionnaire, a sensitivity of 100% was achieved. With the modified FR questionnaire, a higher specificity was shown in a statistical model compared to the FR questionnaire without modification (80% vs 69.5%). Conclusion: FR-based DM screening in dental practice is possible and could help to identify patients with (pre-) diabetes. However, these results must be validated in a large patient cohort. Purpose: Recent data indicate that gene polymorphisms, e.g. those of vitamin D-receptor (VDR), are associated with an increased susceptibility to chronic periodontitis (CP). This study investigated whether VDR gene polymorphism is associated with chronic periodontitis in a population in Western Romania, by determining the prevalence of the BsmI (rs1544410), ApaI (rs7975232), TaqI (rs731236) and FokI (rs2228570) genotypes and comparing the CP group with a periodontally healthy group. Materials and Methods: This case-control study included 53 patients with CP and 47 healthy patients. VDR polymorphisms were genotyped using real-time polymerase chain reaction (PCR). The associations between VDR polymorphisms and CP were determined using logistic regression models, adjusted for patient age and serum level of Vitamin D.
Results: We found a statistically significant association between the single nucleotide polymorphism (SNP) rs2228570 (FokI) and CP. Compared with subjects having the Thymine-Thymine (TT) genotype, those with the Cytosine-Cytosine (CC) variant were 19 times more likely to have the disease (adjusted odd ratio [OR]: 19.58; 95% confidence interval [CI]: 2.67 - 198.92) and with the Thymine-Cytosine (TC) variant, 8 times more likely (adjusted OR: 7.86; 95% CI: 1.29 - 61.56). Also, for the SNP rs1544410 (BsmI), compared with the Adenine-Adenine (AA) genotype, the Adenine-Guanine (AG) variant had an increased risk of periodontal disease (crude OR: 3.76; 95% CI: 1.15 - 13.80). Conclusion: This case-control study of a Western Romanian population shows an association between vitamin D receptor (VDR) polymorphisms (FokI and BsmI) and CP susceptibility. Purpose: To retrospectively evaluate the clinical outcomes of subgingival debridement (e.g. scaling and root planing, SRP) and application of either a chlorhexidine chip (PerioChip, PC) or Arestin (AR) minocycline microspheres in patients with chronic periodontitis during supportive periodontal treatment (SPT). Materials and Methods: Patients diagnosed with moderate to severe chronic periodontitis who were treated with SRP and a slow-release device during SPT were evaluated (total n = 53; n = 37 received PC, n = 16 received AR). Clinical measurements at baseline, 3, 6 and 12 months included changes in probing pocket depth (PD), bleeding on probing (BOP) and clinical attachment level (CAL). Results: Both treatments led to a reduction in PD and gain of CAL. AR showed higher improvements in pockets of ≥7 mm compared with PC. In contrast, PC was more effective in 5-6 mm PD. At one year following treatment, both treatments reduced the need-for-surgery index (95% to 100%) of the sites at baseline to 30% for AR and 42% for PC, with no differences between PC and AR. Conclusions: In patients enrolled in SPT, the use of both PC and AR in conjunction with subgingival mechanical debridement represents an effective treatment modality for improving the clinical outcomes and reducing the need for surgery. Purpose: To evaluate the association of severe periodontitis with overweight and obesity. Material and Methods: Full-mouth periodontal examination was performed on a random sample of 80 obese, 69 overweight and 87 normal-weight individuals (≥ 18 years). Severe periodontitis was defined using the Centers for Disease Control and Prevention - American Academy of Periodontology (CDC-AAP) case classification. Weight (kg) and height (m) were measured by a single examiner, body mass index (BMI) was calculated, and the subjects were classified as normal range, overweight and obese according to World Health Organization definitions. Interviews using a structured questionnaire were performed to collect data on demographics as well as socioeconomic and health status. Chi-squared and logistic regression tests were used to assess the association between severe periodontitis and obesity (p ≤ 0.05). Results: Although severe periodontitis was significantly associated with obesity (OR = 3.25, 95% CI = 1.27-8.31, p = 0.01), it was not associated with overweight (p = 0.59). Conclusions: In the present study, severe periodontitis was associated with obesity but not with overweight. Patients diagnosed with obesity should be referred for periodontal evaluation. Purpose: To evaluate the inhibitory effects of different toothpastes on demineralisation of incipient enamel lesions using a toothbrush simulator. Materials and Methods: Fifty enamel specimens were prepared from extracted human molars. The specimens were randomly assigned to the following groups (n = 10/group): 1. no treatment (control); 2. toothpaste containing arginine (ProRelief, Colgate;); 3. fluoride toothpaste (Pronamel, Sensodyne GlaxoSmithKlein); 4. tooth mousse containing casein phosphopeptide-amorphous calcium phosphate (CPP-ACP) (Recaldent, GC); 5. toothpaste (Restore, Dr. Collins) containing bioactive glass (NovaMin, GlaxoSmithKlein). All specimens were exposed to pH cycling. The remineralising agents were applied to the samples with a toothbrush simulator for 2 min twice a day for five days. The weight percentage of mineral changes for the elements calcium (Ca), phosphorus (P), sodium (Na) and silica (Si) were measured by SEM energy-dispersive x-ray spectroscopy (SEM-EDX). SEM revealed properties of treated enamel surfaces. The data were analysed using one-way ANOVA. Results: Statistically significantly higher levels of Ca and P were found in all groups compared to the control (p < 0.05). Conclusions: The toothpastes' efficacy of inhibiting demineralisation depended on the active ingredients in the respective toothpaste. The demineralisation inhibition efficacy of the tested toothpastes depended on the active ingredients in the toothpaste.